I recently picked up a copy of my favorite game Stardew Valley again. If you don’t know the game, I can highly recommend it! You inherit a pixel farm and you are in charge of everything. Crops, animals, fishing, mining and never forget to socialize. My plan was to shut off work for at least a few hours while playing. But at one point you inevitably start optimizing your farm. In most cases, the layout of crops. 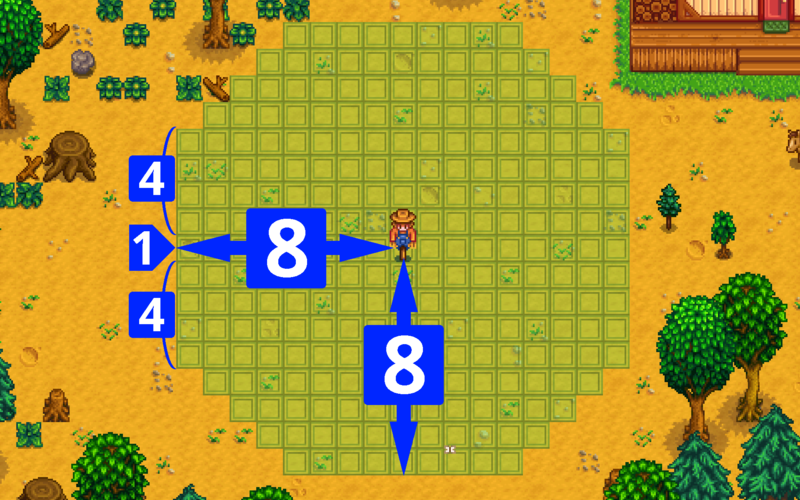 Aaaaaaaand that’s how you turn a farming game into an optimization problem you try to solve with R.
If you start a standard farm, this is what you can work with. The first step is to get the layout into R. Luckily, I found a reddit post, where someone posted the layout as an excel file. I converted the file into a matrix and a long data frame. The data frame is for plotting and the matrix for the actual optimization. The green tiles are the ones we can use for farming. In theory, we could plant 3414 crops there. But the tiles are totally unprotected against the nasty crows that would eat all your precious crops. We need scarecrows to protect them. When you plant your crops, you should make sure that your crops fall into the range of a placed scarecrow. No crow will ever touch anything there. A single scarecrow can protect 248 tiles. And now we have our first optimization problem: Where should we place scarecrows on the farm to maximize the protected area? Now of course we could just blindly put them on the map until everything is covered. But this would a) reduce the number of tiles we can use for growing crops and b) result in a lot of unnecessary overlap between scarecrow ranges. So the goal is to maximize the covered area and minimize the overlap of scarecrows. This is not an easy task though. If you want to place one crow somewhere on the farm, you have 3414 possibilities to do so. For two crows 5,825,991 and for three 6,626,093,764. So it is definitely not a viable option to try out all possible placements, especially when the number of crows increases. We will not be able to get the optimal solution, but we can try to come as close as possible. This is the theory, now to the code. The code of the helper functions (add/delete/move/teleport scarecrows) can be found at the end of this post. This initial solution covers 820 tiles. Now onto the optimization. Note that this will run for a while (R and loops, you know). If you want to optimize the runtime, implementing it in C++ with Rcpp might do the trick. Below is the best layout found during the optimization. I am sure nobody wants to water those crops manually, so we need to place sprinkler. To optimize their placement, we do exactly the same as for scarecrows. Our optimization goal is to maximize the number of protected and watered tiles. This is the final layout. The dark blue tiles are the ones that are watered and protected by a scarecrow. light blue tiles are only watered, dark green tiles only protected and light green ones are neither. This layout gives us 3144 watered tiles with 180 sprinkler and 2998 of those are protected by a scarecrow. If you run this code by yourself, you will notice that you might get different (even better!) results. Simulated annealing is not deterministic, hence it produces different nearly optimal solutions in each run.